Waves of snow and clouds wash over the blocky summit of Hallet Peak on a spring morning. 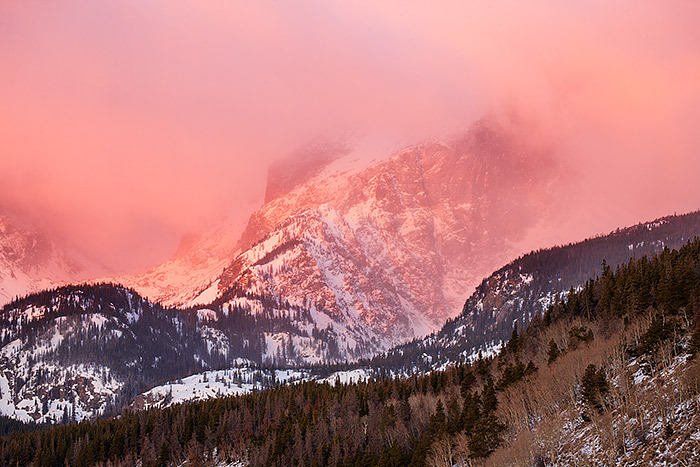 Sunrise illuminates the iconic features of Hallet Peak in warm reds and pinks. Hallet Peak is one of Rocky Mountain National Parks most recognizable features. Visitors to Bear, Nymph, Dream and Emerald Lake get an impressive and up front view of Hallet Peak. This view is from the Bierstadt Moraine is equally as impressive. Photo © copyright by Thomas Mangan.